Acrylics on watercolor board - 30" x 22"
"Some paintings are fondly remembered because the simple act of creation was so enjoyable. 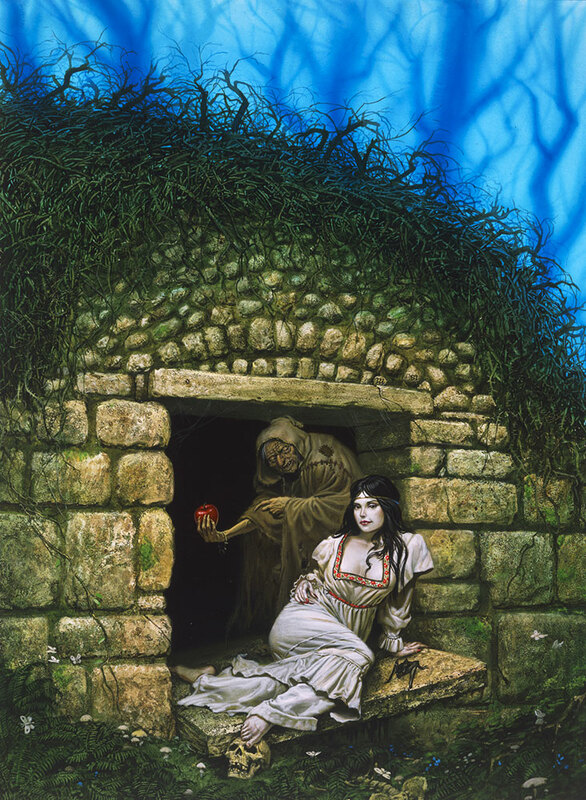 This cover art for Tanith Lee's novel Red As Blood is one of those paintings. I regret selling the painting. There are collectors out there who I strongly suspect are psychic. They always manage to call me with offers to buy art on days when I am feeling down on my work, and I foolishly let some piece or another go because I'm tired of looking at it. Then I find I miss it. If I hadn't started using an answering machine, I might not still own any of my work." How would it be if Snow White were the real villain & the wicked queen just a sadly maligned innocent? What if awakening the Sleeping Beauty should be the mistake of a lifetime--of several lifetimes? What if the famous folk tales were retold with an eye to more horrific possibilities? Only Tanith Lee could do justice to it. In RED AS BLOOD, she displays her soaring imagination at its most fantastically mischievous. Not for nothing was the title story named as a Nebula nominee. Not for nothing was the author of THE BIRTHGRAVE & THE STORM LORD called by New York's Village Voice, "Goddess-Empress of the Hot Read." Here are the world-famous tales of such as the Brothers Grimm as they might have been retold by the Sisters Grimmer! Fairy tales for children? Not on your life!